Cooking without a Net: What Can You Do with a Butternut Squash? So I had this butternut squash I bought last week at the Green Market with no real idea about how I was going to prepare it. I had just made sweet potato-carrot soup so I didn't want to make more soup, and I didn't feel up to making a stew, so I went online to find some inspiration. I know I've mentioned fooddownunder.com here before. There are some 281,476 recipes on that site from all over the world, and I've found some good ones. 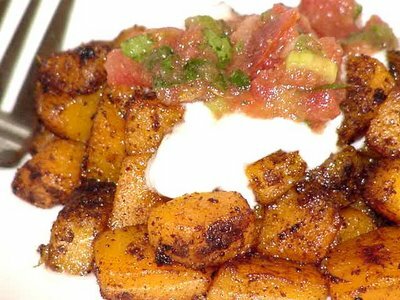 There are 288 recipes that use butternut squash. I found this one pretty quickly. The recipe is actually for Butternut Squash and Black Bean Tacos, but I thought it would be interesting enough just to make the butternut squash part of it. I was a little worried about what it might do to my skillet. 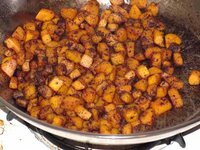 After the squash is tossed in a hot skillet with some oil, you add the spices and continue to cook it over high heat for about ten minutes. I was afraid the spices would either burn or stick to the bottom of the skillet, or both. But I kept my eye on it, and although it got a little dicey and the spices were definitely starting to smell roasty toasty and there was a black film starting to form on the bottom of the pan, it made it through the ten minutes. Here's what the pan looked like when everything was done. The squash was slightly undercooked after the ten minutes, but the pan sizzled a good five minutes more after I turned off the heat, which finished cooking the squash. And after the pan cooled down it was quite easy to clean. The end result was fantastic. The cinnamon and cumin, toasted just to the point of burning, fused together for a truly unique, smoky flavor that is hard to describe and impossible to resist. Because of the cumin in this dish, I thought the yogurt and salsa would be a good garnish, but the salsa actually took away from the intense spicy flavor and was unnecessary. The yogurt by itself is all the garnish necessary - it actually helps make a sauce out of the spices. You have to try this. Go out and find yourself a butternut squash and cook up some roasted toasted goodness. And do yourself another favor. Go get some Vietnamese Cassia cinnamon instead of that stuff they sell in the grocery store. It is the strongest, richest, and sweetest cinnamon around. You can find it at Penzey's or The Spice House. Cut the butternut squash in half crosswise at the narrowest point. Cut each half in half again lengthwise. Peel each section with a vegetable peeler or a flexible sharp knife. Use a teaspoon to scrape out the seeds and strings. Cut into 1/2" dice. Heat large skillet over high heat. Add olive oil. When it smokes, add squash cubes and toss well. Sprinkle with salt, cinnamon, cumin and pepper. Saute over high heat, tossing frequently, until browned outside and tender but not mushy inside, about 10 minutes. I'm so pleased you chose to respond to mine, Sopheetsa. I hope you like it, and that you will come back and tell us what you think of the recipe.